“On their 1976 self-titled album, funk rock band Mother’s Finest wrote a song ironically titled “Niggizz Can’t Sang Rock n’ Roll.” Founded in the early ‘70s by black vocalists Joyce “Baby Jean” Kennedy and Glenn “Doc” Murdock, Mother’s Finest made a controversial and bold statement against the idea that African Americans couldn’t play or sing rock music. Forty years after the song’s recording, there is still resistance to black people performing and listening to rock music in the United States. Fortunately, black people—especially black women—have found ways to reclaim the genre in recent years. These efforts are particularly significant when you consider that, though largely forgotten in our whitewashed annals of history, black women helped create the genre of rock, which has its roots in blues, country, jazz, gospel, and R&B. Sister Rosetta Tharpe became known as “The Godmother of Rock n’ Roll” because she sang gospel while playing an electric guitar, and went on to influence Elvis Presley, Chuck Berry, and Little Richard. The outspoken spirit and sensual vocal delivery of funk singer Betty Davis was also highly influential in the music’s development, ushering in a style that can still be heard today in Toronto blues rock vocalist SATE and punk rock musician Tamar-Kali. Bessie Smith, who became known as the “Empress of The Blues,” was one of the first people to embody the spirit of rock ‘n’ roll, thanks to her hard-drinking, rough-and-tumble personality. She also embodied the difficulty many black musicians had in navigating the music scene, as they dealt with racism from white people and policing from black people (and, for black women, sexism on top of this). Though Smith was proud of her race and once stood up to the Ku Klux Klan when they threatened to disrupt one of her performances, she was shunned by black middle-class communities who felt that blues music degraded black people as a whole. In addition, her personality was considered too bold by some black people. Why are the contributions of black musicians like these so rarely acknowledged? In part, it has to do with monolithic stereotyping of black musicians and black music listeners—the association of current black musicians and black music fans in the United States with only hip-hop, R&B, and pop. In her book What Are You Doing Here? 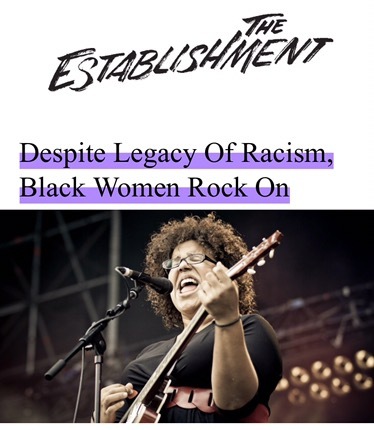 : A Black Woman’s Life and Liberation in Heavy Metal, music journalist Laina Dawes states that the monolith stereotype is the result of the whitewashing of rock music, as well as the black community’s need to preserve cultural bonds and appear respectable. Since slavery threatened to rob African Americans of emotional ties to past lives, codes of conduct were developed to help maintain these ties and ensure survival. These codes consisted of work songs, field hollers, dance, and other creative forms of communication that would provide the foundation for gospel, blues, jazz, and ultimately rock ‘n’ roll. In order to preserve their cultural heritage and stay on the good side of whites, the descendants of North American slaves would police black culture and each other based on what they considered to be “for blacks” and “for whites.” Policing was often done when black people appeared to embody stereotypes or when black artists became dwarfed by white artists who commercialized their work and made it popular. In What Are You Doing Here?, music professor Maureen Mahon explains how the whitewashing of rock ‘n’ roll began in the ’50s and ’60s, and how middle-class black Americans would process this. “As more white people started to be attracted to rock ‘n’ roll, black people started to think, ‘This is for them, not for us,’” Mahon stated. “There were always black people participating and present, but they started to be outnumbered.” Beyond the sheer outnumbering, white rock musicians often had more success performing songs originally recorded by black blues, R&B, and rock musicians. Big Mama Thornton’s “Hound Dog” got overshadowed by Elvis Presley’s version, while Erma Franklin’s “Piece of My Heart” was overshadowed by Janis Joplin’s version. By the 1980s, the only way that a black person could be commercially successful with a rock song was to do it with the platform of a commercially successful pop star. Prince did it with the album Purple Rain, and Tina Turner did it with the album Private Dancer. The commercial success of ‘80s pop (and later hip-hop) set the tone for today’s music industry, while affecting how rock bands with black members could promote themselves. Prominent 80’s bands such as Living Colour, Fishbone, and Mother’s Finest had to use illustrations on their albums instead of band photos in order to dismiss the assumption that their music was pop, R&B, or hip-hop. In the wake of appropriation and respectability politics, it’s taken the concerted efforts of individual performers and organized movements to reclaim the genre for black audiences. 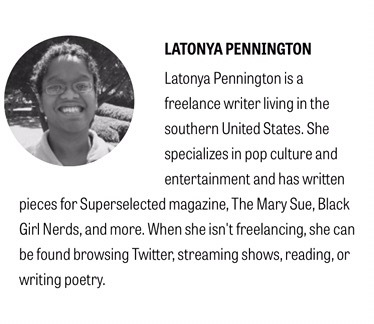 Beyoncé is hardly the only black woman working to reclaim rock. Tina Turner and Janet Jackson paved the way for black women to reclaim rock through the pop genre. This past February, roots rock band Alabama Shakes won Grammys for Best Rock Song and Best Rock Performance for their song “Don’t Wanna Fight.” Fronted by Brittany Howard, Alabama Shakes’ win for Best Rock Song marked the first time a black woman has been nominated and victorious in the category since Tracy Chapman in 1997. Outside the mainstream success of Beyoncé and Alabama Shakes, there have always been independent black rock artists making music in the United States. Alexis Brown sings, screams, and growls as the lead vocalist for heavy metal band Straight Line Stitch. Jackie Venson is an emerging blues guitarist with gorgeous vocals and down-to-earth, passionate guitar playing. Cindy Blackman is a jazz and rock drummer who has provided the backbeat for Lenny Kravitz, Carlos Santana, and herself as a solo artist. They may not have the gigantic following Beyoncé has, but they have artistic freedom that black music artists have been fighting for over many years. There have also been more organized efforts to reclaim the genre. In 2004, poet Jessica Care Moore created the performance program Black Women Rock! as a tribute to Betty Davis, and to showcase the performances of black female rock musicians from across the country and the globe. Another hub for black women and men in rock today is the Afropunk movement. The Afropunk movement began as a documentary film titled Afropunk: The Rock n’ Roll N****r Experience. The film was shot between 2001 and 2003 and was released independently the following year. While the title seemed to side-eye the Patti Smith song of the same name, the content showed young black punk rock musicians and fans who enjoyed the scene yet felt alienated from it and other black people due to its association with whiteness. The film’s creator, James Spooner, explained in a Racked article that he originally made the film for his younger self who was interested in punk rock. The documentary would eventually inspire the very first Afropunk festival in 2005, as well as a community website. Both the site and annual festival are still going strong, with thousands of attendees and social media followers. Another movement working to combat the pigeonholing of black rock artists is the Black Rock Coalition, founded in 1985 by Living Colour guitarist Vernon Reid, music journalist Greg Tate, and producer Konda Mason. Thirty years later, The Black Rock Coalition continues to be a haven for black rock artists and independent black artists of all genres through programs that include showcases, independent compilation records, and more. Thanks to The Black Rock Coalition, Black Women Rock!, and the Afropunk movement, black rock musicians without the platform of pop musicians can continue to reclaim rock as independent artists. Artists achieving mainstream success with their reclamation of rock, like Beyoncé and Alabama Shakes, have also been invaluable. Previous Borderline Personality Disorder – What Is It?